Wireless transmission of pulse count and TIC. RF Pulse allows wireless transmission (via Enocean Technology) of pulse counts (incremented on 2 digital inputs) and informations from electrical counter (via TIC). To know if the product works fine, there is a DEL on the front face. It blinks when the product sending frame. There also is a push button that allows to send pairing frame and reset counters if it long puhsed when the product supplied. 1 TIC input, compatible with Linky. 2 digital input for pulse count. 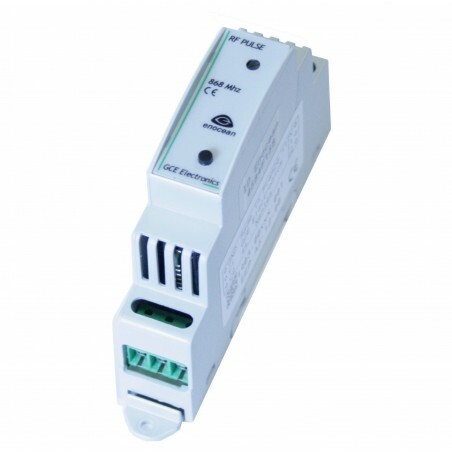 Enocean emitter, EEP A5-12-00, 12 channels. Consumption less than 0.5 Watts. DIN rail fastening (1 module wide).